San Antonio is known for it's generally balmy winter weather. We don't tend to have temperatures below freezing. Most of us don't even bother to have a "winter" wardrobe, because winter here means that you might need a light jacket. Sometimes we have hard freezes, with sleet and yucky driving, but those are not the norm. The last significant snowfall was in January of 1985, when we were visited by an entire FOOT of the white fluffy stuff. It was lovely, and the world grew quiet. Except we were snowed in for THREE days, because there wasn't a snowplow within 400 miles. Everyone went a bit stir crazy that week. 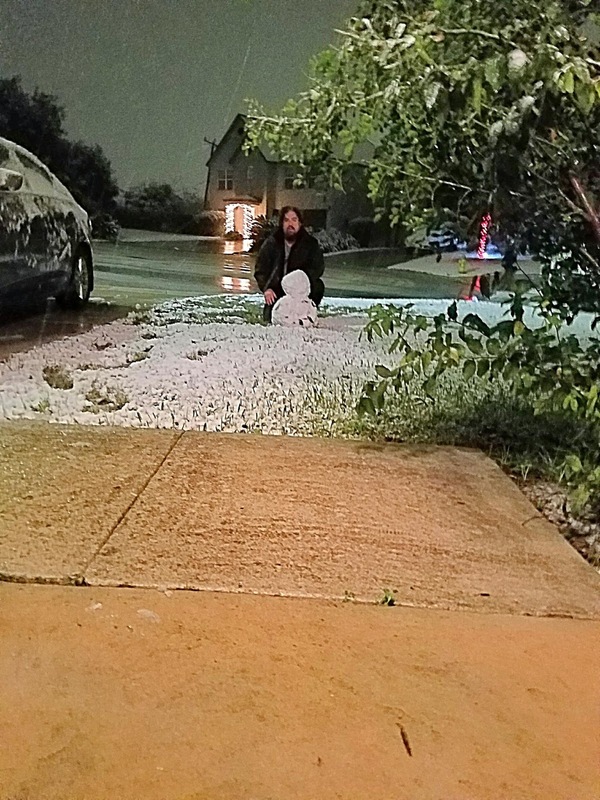 A foot of snow in the North wouldn't have been a big deal, but in San Antonio? Whoa. We all heard the whispers, the rumors. The local weathermen tried using words like "probable, but not likely". Their caution did nothing to stop the excitement. Even the teenagers were hopeful, but the kids? The kids were beside themselves, reciting every prayer that they knew, their bodies quivering in anticipation. It had been raining all day, a chilly kind of damp that seeped into my bones. 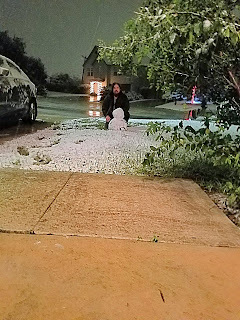 We were all at home as the night descended, when my mom texted me to say that her friend on the other side of town had snow. I was suspicious, but then my friends began excitedly texting about the same thing. 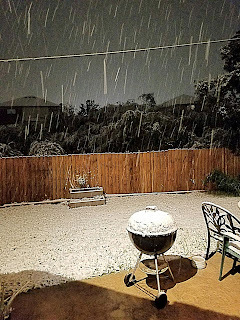 New Braunfels has snow! I was still skeptical, but then Maisy demanded to go outside. I looked out the back door to see rain, and...something else. At first I thought that it was sleet, but the flakes were too fluffy, and they drifted lazily toward the ground. My response after seeing this was disbelief. It couldn't be! 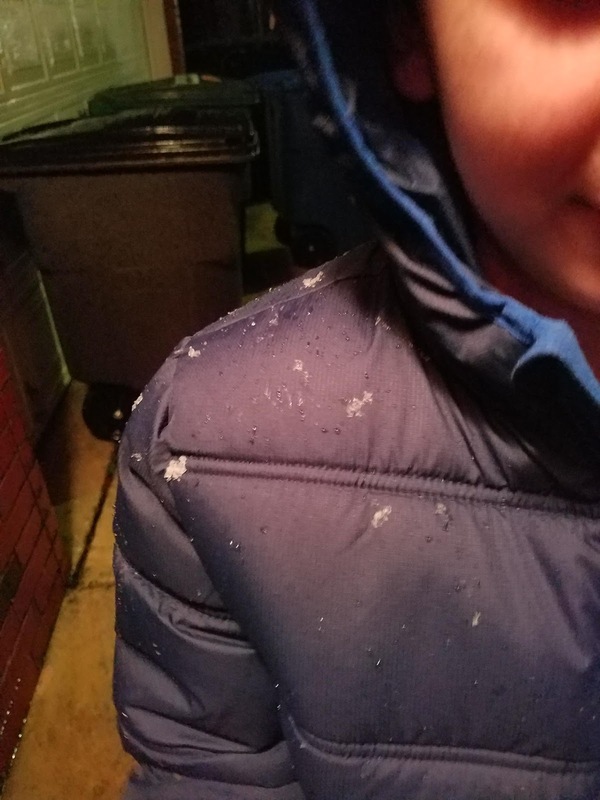 I texted my mom to ask if this was snow, because it had been so long. Larry, Zane, and I headed outside, and ALL of our neighbors were outside staring at the sky. SNOW!! Laughter echoed in the cold air. All of our daily concerns were put on hold. Everyone we could see snapped pictures, built snow people, made snow angels, had snow ball fights, and just got caught up in the moment. The amazing thing about snow is that for a few delightful moments, it covers up slight imperfections in the world, and you start to feel as though you are in a painting. The ugliest places become brighter. Trees become ethereal. Everything gets quieter. It's blissful. 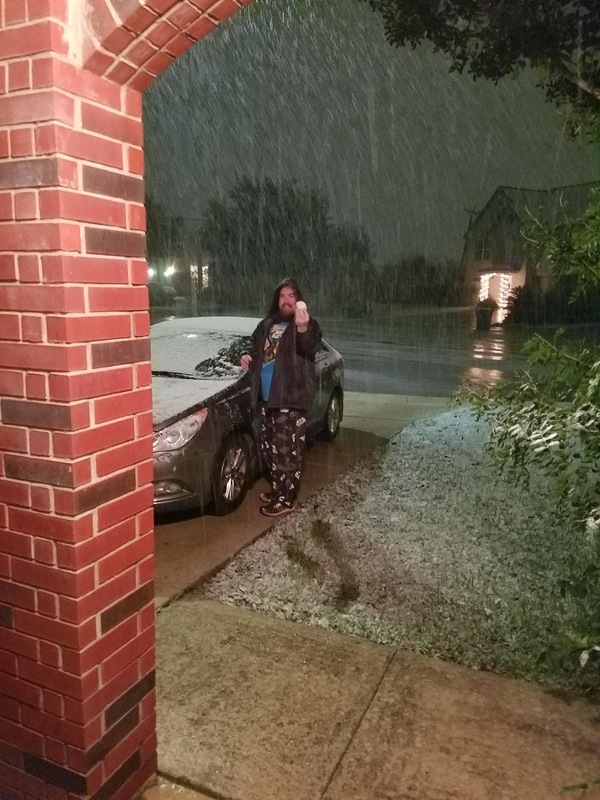 My normally grumpy husband practically glowed with excitement as he began rolling up as much snow as possible into a ball so that he could make a snowman. It made me happy to see him happy. Zane was all about the fun, until his hands got cold. He was in and out, playing. I spent my time going from the back door to the front, content to snap pictures and watch the world become magical. Such wonder is always fleeting. As soon as the sun rose, the snow was gone. It was as if it had never been. The memories remain to remind us of wonder.